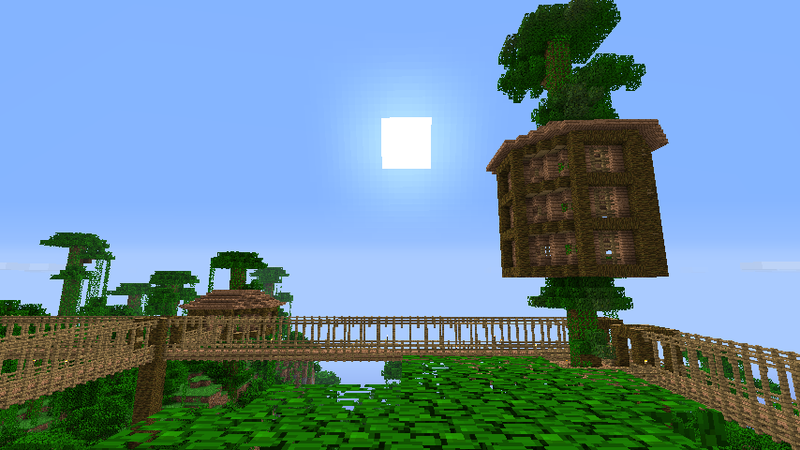 So ever since Jungles came out, I wanted to build a treehouse. And after Large Biomes came up, I found myself with more than enough space and materials in which to do it! And I didn't want to build just one, so I'm building a whole interconnected complex! While this is done Legit on Survival, I did do it on Peaceful. 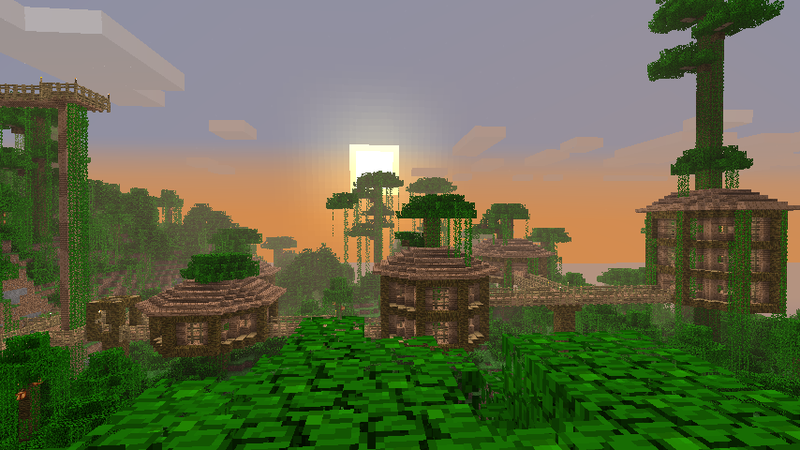 So I didn't have to worry about hunger or mobs, but I did have to worry about fall damage, which has happened a lot since I building up in the trees. I've died twice now. Map Download I highly recommend playing this map on Peaceful as that's how I built it. There are a few signs to help you navigate to the main features of the map. Enjoy! I am pleased to present a completed version of this map. I've done some renovations to improve things with additional features that have come out since I started building. You could go somewhere with this. Wow, I didn't expect this, they really look good! No trees are tall enough. Heck, normal trees should be twice as tall as they are now. looks really nice. Make more houses and connect them all. 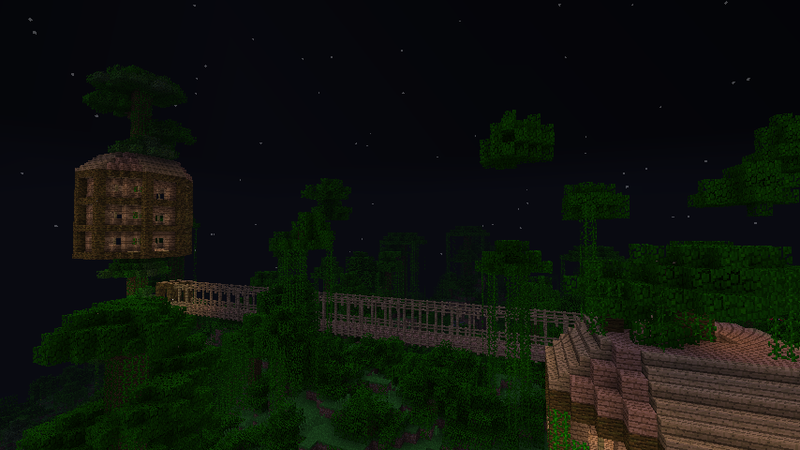 Also, hollow out some of the trees and make it into an elevator or something into a secret base. My friend safari is water, PM me and I'll add you! 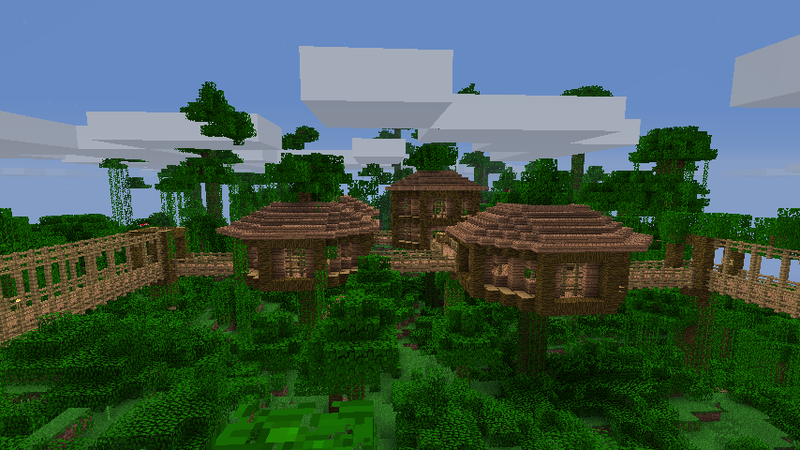 Those are some pretty treehouses. The problem is, minecraft is about mining, and that's harder when you have to plummet to your doom climb up and down trees on your way to work. You might also want a workshop right at your mine entrance? Thanks everyone for the compliments! I'm planning on adding more of these, with two trees already picked out for the next ones. One of them is the tree I'm standing on top of for the screenshot. I hadn't thought of that. I'll have to try that on some of the smaller ones to give me more space to work with. Already have a workshop in fact. Its visible on the ground below the front left house, and leading from it are stairs down into a cave where I have my mine entrance and a nether portal. And as far as getting up and down, there are vines going up to the base of each house, with a little hole to get in and out of. The only falling danger I've had is during construction. You could make some pretty looking pools of water on the ground. Then you can jump and land in them to exit a tree quickly and avoid fall damage. I recommend using fences and fence gates for windows instead of glass. It adds to the feel of the complex you're working on. I think glass would look too out of place in the jungle. That's just my two cents- do what you want. Yeah, I've got fence windows like that so far for the windows I do have. Perhaps I will use those for all of them. 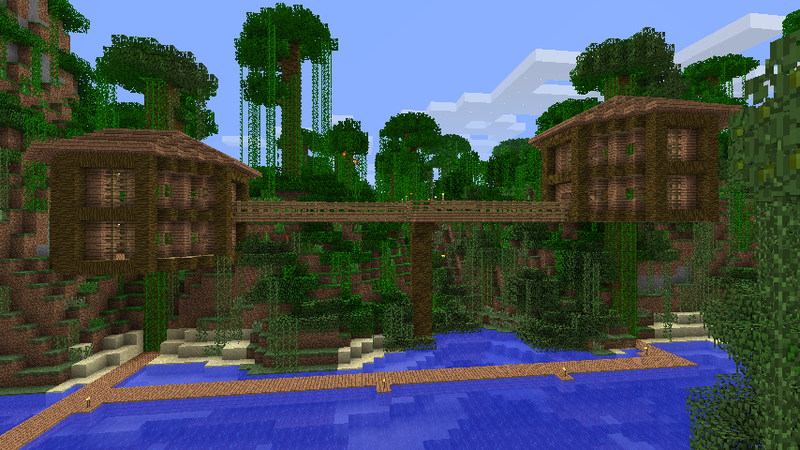 You're right, it would look out of place in the jungle and with the look I've built so far. I fell while making this one and died because one side of it overlooks a 70 meter drop. There is something I like about the design of that bridge in those last pics. 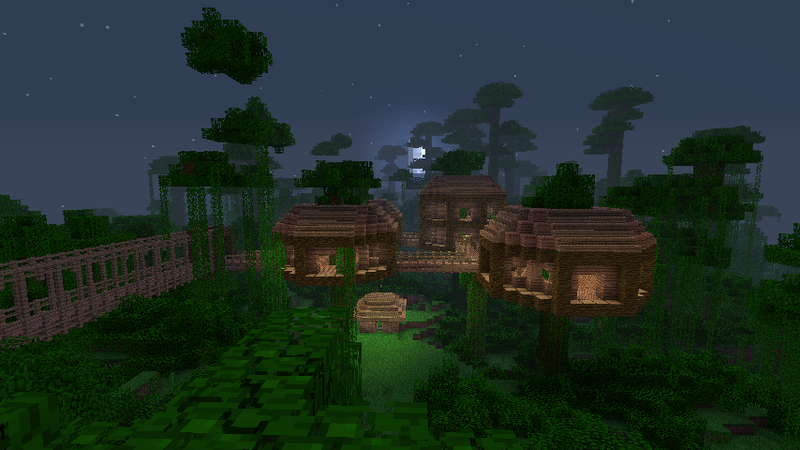 The tree houses themselves are too large in scale and dwarf the tree's they are on in my opinion. Otherwise I like what you've done there. Thanks! 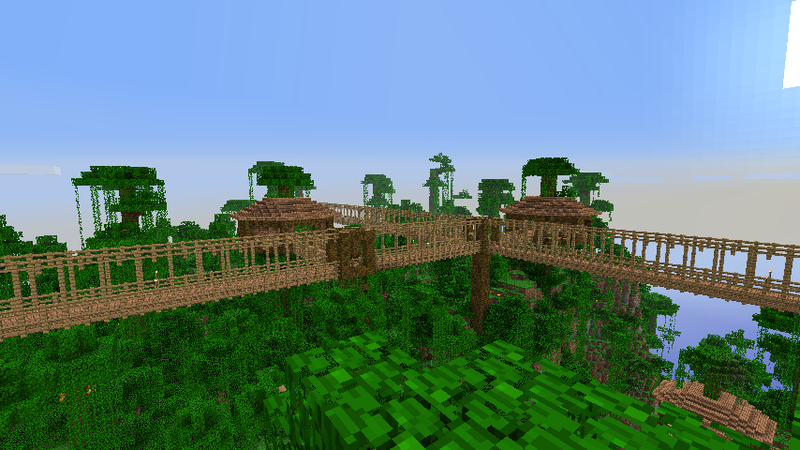 The bridge is patterned after aerial hanging bridges found in tropical rainforests and is intended to be suspended from the top rows of fencing, which are meant to be suspension wires. As for the size relative to trees, I had a couple challenges there. I had to strike a balance between them looking oversized and having enough space inside them to do anything with, and second I was trying to achieve a certain look/design which required a certain minimum size due to the blockiness of Minecraft. Hehe. Yes, when my wife saw these she asked if I had Ewoks living in them.